Point buy system is a great way to make character generation deterministic, but the calculations can be annoying. Let d20 Ability Calculator do the math, while you concentrate on the fun parts of creating your role playing game (RPG) character. 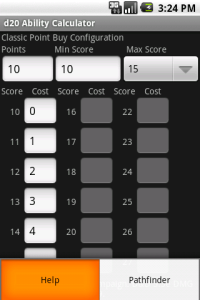 The d20 Ability Calculator is simple and easy to use, specifically made for the Android platform. It includes the ability scores and modifiers from the Revised (v3.5) d20 System Reference Document (SRD). The paid version also includes the Pathfinder Roleplaying Game variant of ability point buy system. See Open Game License information. Because the SRD does not include rules for point buy system, you will need to get this information from other sources, for example from the Dungeons & Dragons 3.5 Edition DMG p. 169. The program includes an easy way to enter point buy configuration parameters. NOTE: Does not apply to Pathfinder mode! NOTE: Not for Dungeons & Dragons 4th Edition! 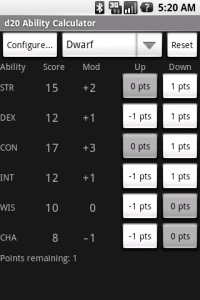 The d20 Ability Calculator for Android is no longer available.